My 6-year-old son and I had a blast at Mirvish Productions’ Roald Dahl’s Charlie and the Chocolate Factory, currently on stage at the Princess of Wales Theatre until January 6, 2019. It was a very late school night for a little kid and sitting still for over two hours isn’t his strong suit at the best of times. There were certainly enough lights, sound, action and stage effects to hold his attention and he was still captivated when the final curtain went down at 10 PM. In addition to its musical incarnation, the story is a time-honoured classic of children’s literature and a major motion picture by Tim Burton starring Johnny Depp. Suffice it to say, the dark fairytale is widely known. Henry Boshart, the show’s star in the title role, appeared to be merely a few years older than my kiddo. The Broadway size talent in this pint-sized star is truly awe-inspiring. With precocious stage presence, Boshart has no trouble holding the room’s attention. This is a big sing for a little kid and he demonstrates excellent vocal technique, with very stable, supported singing throughout all parts of his range. He does not sacrifice performative playfulness for vocal control either. His dramatic interpretation is also superbly mature. Even though Charlie is poor with nothing of value to call his own, we never once feel sorry for him as played by Boshart. His conviction that he is blessed with a loving a supportive family shone through every word and note. We believe he is better off than all those spoiled kids on the factory tour because he believes it. The set, lighting, and costume design are so vibrantly fantastical that I forgot I was suspending my disbelief. Our first glimpse of the chocolate factory was so breathtaking that I heard audible “ooh, aah” gasps from the audience, my little one included. Vibrant candy pinwheels, glitter, and a flowing chocolate waterfall were just the beginning of the visual feast. The fantastical elements of the story were so credible that it was easy to get into the heart of the real-world lessons learned from each character’s foibles and perils. And boy do those spoiled, mean kids face perils! So convincing was the tearing apart of Veruca Salt (Jessica Cohen) by squirrels that my son wondered how she could still be with us to take a bow at the end. Stage effects are a huge part of what makes this show so special. The blowing up of Violet Beauregard (Brynn Williams) was also convincing and hilarious. But the real triumph of the piece is the realization of the Oompa Loompas. I must confess, I wasn’t sure how this production was going to pull this off. Just as I was thinking through how to explain the sudden appearance of a dozen little people after the show, I was pleasantly surprised. The Oompa Loompas were played by a team of skilled singing puppeteers, deftly manipulating marionette bodies just below their necks. The singer-puppeteers performed using their own heads as the puppet heads with their actual bodies dressed in black. My description can’t possibly do it justice but believe me when I say that it looked very cool, and very hilarious. As for how they made a miniature, lifelike version of Mike Teavee (Daniel Quadrino), the screen-time obsessed menace who gets shrunken and put on TV, I have no idea. I choose to believe sorcery is afoot, but I’m okay with that. 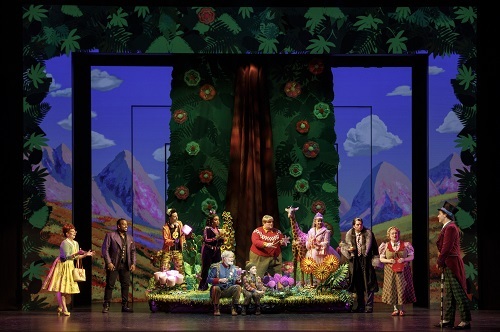 Roald Dahl’s Charlie and the Chocolate Factory is playing until January 6, 2019 at Princess of Wales Theatre (300 King St W). Showtimes are 7:30 PM from Tuesday to Saturday, 1:30 PM on Wednesday, Saturday and Sunday, with additional performances at 1:30 PM on December 27 and January 3, and 7:30 PM on December 30. There is one captioned performance at 1:30 PM on December 15. Ticket prices range from $39 – 175. Tickets are available online, or by phone at 1-800-461-3333. Photo of company by Joan Marcus.